At the end of 2014, BMW paid homage to their reigning DTM Champion, Marco Wittmann, with a limited run of 23 ‘DTM Champion Edition’ M4 Coupes inspired by the number 23 on Marco’s championship winning racecar. Now, the German KW Performance Partner and Sports Cars Specialist TVW Car Design has taken one of these extremely rare cars to the next level of exclusivity and driving dynamics. 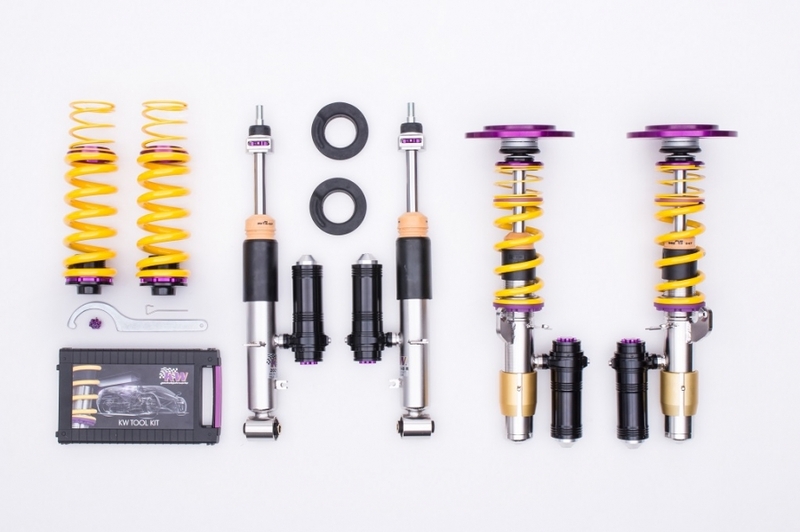 TVW Car Design takes the handling and grip of the M4 Coupe chassis to the next level with our fully adjustable KW Clubsport coilover suspension whose broad performance envelope make the car equally at home on the road or racetrack. TVW Car Design also replaces the matt black 19-inch alloy wheels of the DTM Champion Edition with the significantly lighter BBS FI one-piece forged alloy wheels. Sized 9.5J front (8.9 kg) and 10.5J x 20-inch (9.2 kg) rear, these wheels are shod with 255/30ZR20 and 285/30ZR20 Michelin Pilot Super Sport UHP tyres. To further the cause of power and sound, TVW chose the Akrapovic Evolution Line titanium exhaust system, whose carbon-fibre tail pipes are integrated into the carbon-fibre rear diffuser. The exhaust flap position – and thus the soundtrack intensity of the M4’s turbocharged straight six motor – can be adjusted from the steering wheel. This sports exhaust system not only increases output by 17.5 hp and 17.4 Nm through lower backpressure, it also saves around 10kg. As a tribute to Marco Wittmann’s Ice Watch BMW M4 DTM racecar, the DTM Champion Edition road car is available exclusively in Alpine White. M Performance collection components that come standard on this limited edition model are the black front splitter, rocker blades, carbon-fibre front flaps, carbon-fibre door mirror caps and rear spoiler and diffuser inserts. And just as on the racecar, the bonnet, roof and boot lid are finished in matt black and emblazoned with colourful stripes, with the BMW kidney grilles outlined in orange. A decal set, including lateral stripes, starting numbers, and flags and logos, is applied to the cars flanks. In the interior, carbon-fibre trim is used on the dashboard, centre console and steering wheel. 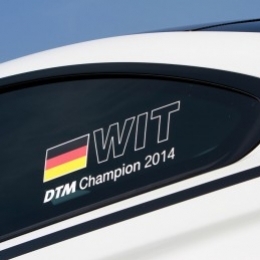 The dashboard bears the lettering “DTM Champion Edition” and the sequential number of this Special Edition. The dashboard carbon-fibre and the special sill plates carry the signature of the 25-year-old DTM champion. 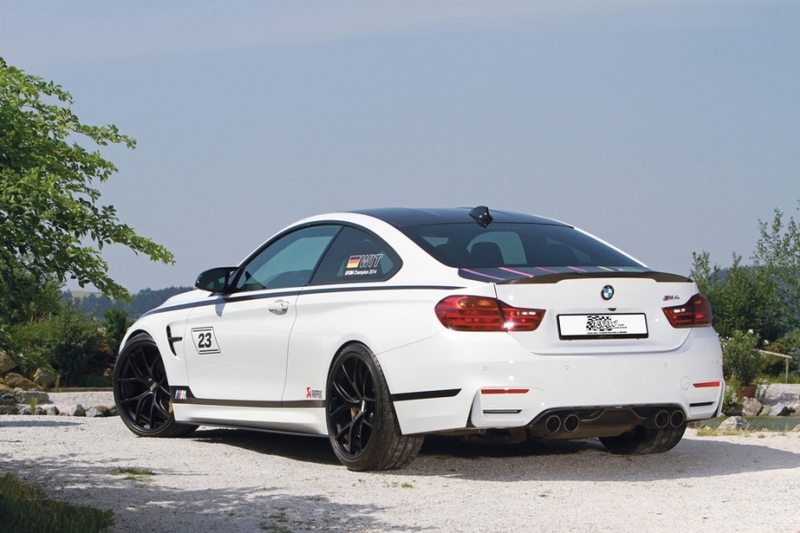 TVW Car Design’s performance package of K&N free-flow air cleaner, Akrapovic titanium exhaust system and additional ECU increase the power and torque of the twin-turbocharged 3.0-liter engine from 431 hp / 550 Nm to 517 hp / 700 Nm.